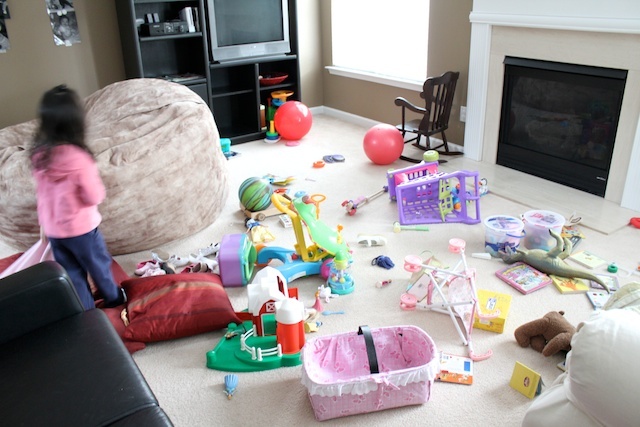 Back to basics tip #19: As a mother of two girls age 4 and 18 months, my house used to look like this. Who knew two little girls could make a mess this big every. single. day.? Don’t believe me? They are in the pictures. Proof. 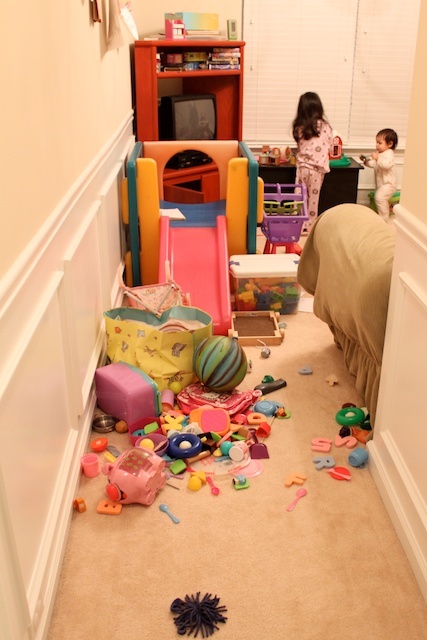 And the mess even traveled upstairs and into other rooms. It wasn’t unusual for me to find toys in my bed, in kitchen cupboards and hidden throughout the house. Every inch of carpet was covered with toys. Ridiculous. To put an end to this insanity, I got clear plastic bins. Shoe box size in a pack of 10. I organized the toys in each bin according to type. It’s soothing for me to sort things. I’m one of those weird people. The rule in our house is each child can only have one bin open at a time. If she wanted to play with toys in another bin, the first bin must be put away. If she is good, sometimes I would spoil her by allowing two bins opened at a time. Oh. You cannot what a difference this makes. My kids learned to appreciate their toys and enjoy playing with them more than before. Not only that, we purchased a coffee table from Ikea that holds all the bins below. 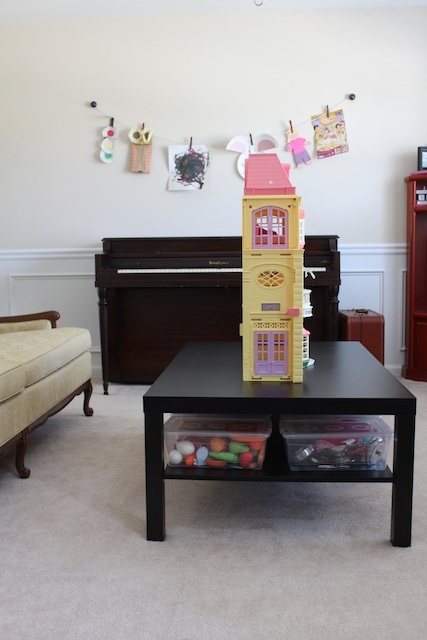 It is nice to have the toys hidden and the play room is more visually appealing. And yes, the play room has undergone a little makeover since the pictures taken at the beginning of the post. The play room is at the front of our house and one of the first rooms people see when they enter our home. I wanted to make it more inviting than childish. It is still a work in progress. 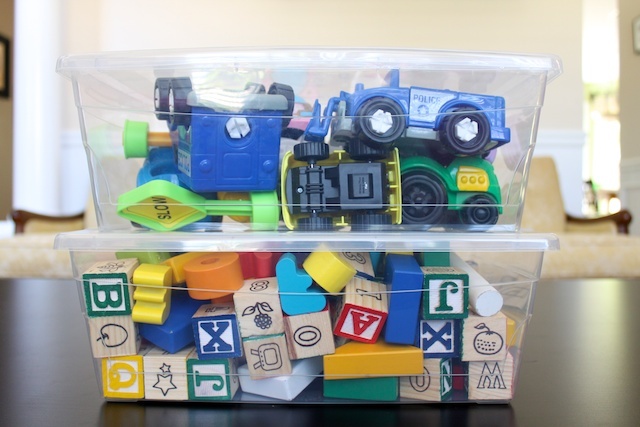 » Tell me… How do you keep your children’s toys under control? Thank you for this post! We don’t have kids yet, but we’re working on it. Honestly, the prospect of living in a constant mess causes me some anxiety. It’s good to see that I can maintain some semblence of normalcy with a little organization. Thanks again! so glad this post can help with your anxiety! and plenty more mom advice here too! I absolutely agree about the bins. 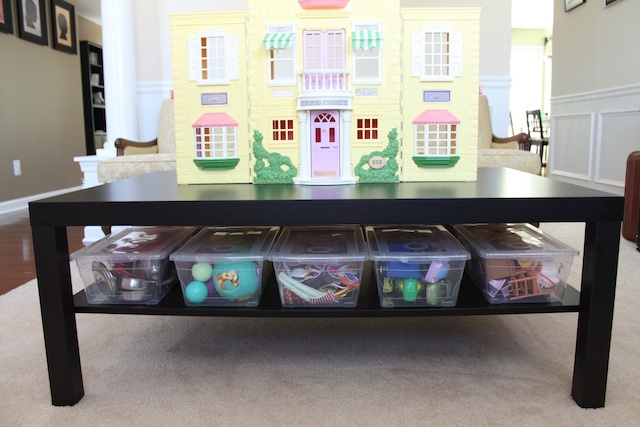 I just used the same ones to do all of our craft supplies and my kids (My boys are 6, 5, and 3 and my daughter is 8 months) have been great about putting things away. 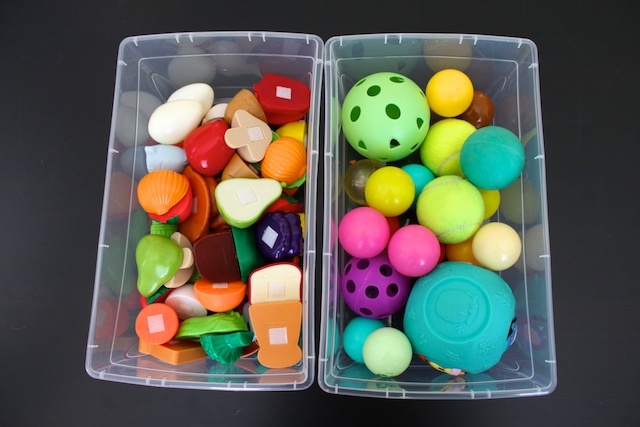 We use larger bins than those for toys but also clear so even my littlest guy knows where to find or stash things. The ONLY thing I might argue with (slightly!) is that I am not quite so strict about the “one bin at a time” rule, only because, when left to their own devices, my boys have found a myriad of ways to use different toys in unexpected and brilliantly creative ways. I can’t tell you the number of adventures the Little People have been on when mixed with the Superheroes and the Brio blocks! But, in the end, they all do end up back in their rightful place (mostly!) We do have a new rule that things must be picked up multiple times a day, most importantly before meals, whenever we’re leaving the house, and before bed. Leaving it until bedtime was too overwhelming. yup. i use the bins for my craft supplies too! i love small spaces. that’s when people live on bare necessity and get creative with their space. The best thing we ever did was move into a house with a basement. LOL. The kids’ playroom is down there, and it does help a lot just to keep most of their toys down there. They are organized into labeled baskets (no lids, because they tend to get lost anyway) which have a matching labeled spot on the shelf. It’s not fancy or pretty but at least now everyone knows where everything goes. And honestly, they read and make things out of paper and cardboard boxes and toilet paper tubes way more than they play with most of their toys. our next house will for sure have a basement. lucky you. I have one basket filled with toys, and that is all they have in the common area. I switch out toys ever month or so (the rest of the toys are boxed-up in closets). This way old toys seem new and exciting each month! I love those bins though! Where did you get them? i bought them at bed, bath and beyond. i use them for everything in the house. i love them. oh yes. please do share the link with me! and aren’t the lack tables nice and cheap? we have a few of them too. What a great tip! 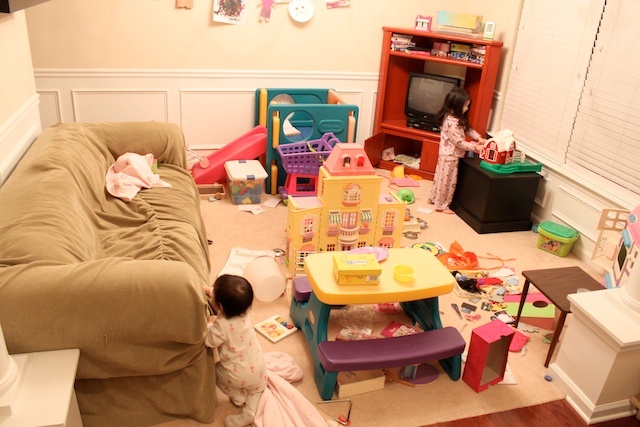 My living room looks like that and I only have one kiddo. We have canvas bins but she just dumps them until she can find what she wants. Maybe clear bins will help solve that problem. I get soothed by sorting as well! Bins are my best friend! Your system looks great! Where did you buy the clear bins in packs of 10? Our toys and crafts are both out of control. found a box of 10 clear bins at bed, bath and beyond. i also used their 20% off coupon to lower the price of it to around $12/box of 10. it was the best deal i found. I just came across your blog and LOVE it 🙂 Where is the Dolls house from? its sooo cute!!! hello sherrie! so glad you love the blog. the doll house is from a yard sale. my mom found it. 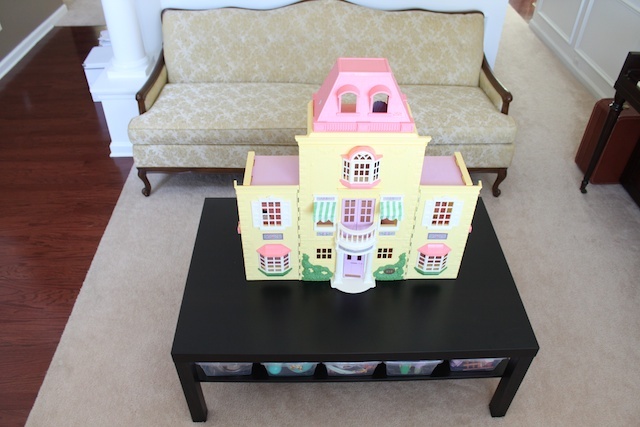 it’s an older version of this http://www.fisher-price.com/fp.aspx?st=10&e=dollhouselanding. the doll house expands out on the sides. Thank you, Thank you, Thank you for this great tip! I have just one little one but she can turn her room upside down in a matter of minutes and I know what you mean about finding toys in your bed. Amazing how toys travel. Thanks again! Going to have to go shopping for bins, not sure why I didn’t think of this, all my craft stuff is in bins.